For an ordinary man, the abstract idea of Nirguna Bhrama a formless concept of God has always been incomprehensible. Our faith , love and devotion do not develop unless we worship a Sagun Brahma. We should start with sagun worship. In the Temple we provide a positive medium to connect the devotees to the supreme with the practice of Daily worship and Aartis. Worship that is performed with all the different accessories like Flowers, Garments, Ornaments creates in the mind of the devotee a distinctive attachment for the Lord. This worship and prayer provide the an un describable Shakti or power of God and eventually helps is to know pure existence, knowledge and bliss. In the temple we perform daily 4 Aartis and the whole atmosphere created by the resounding music of the auspicious sounds and lyrics leads to high concentration and a feeling of oneness in the congregation and ultimately guides devotees towards Bhakti path. We use lamps with lighted wicks in ghee and are waved before Baba. Light produced by the fire is considered auspicious . This ritual also helps the devotees guide towards Bhakti path.Our humble prostration to this all pervasive Sadguru as we experience pure bliss. In our temple like the Sansthan in Shirdi we offer daily 4 Aartis to our lord. Come and join us and feel the power of place where it's sung and experience it for yourselves. 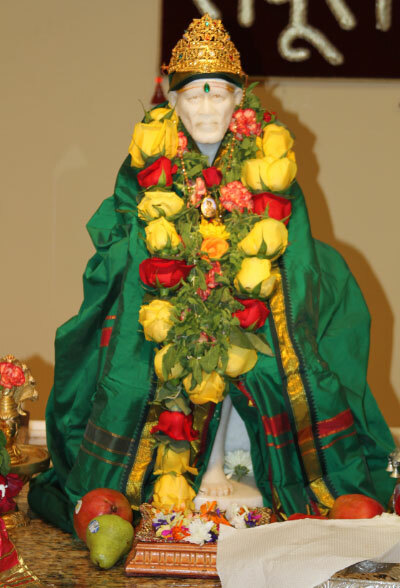 Please see the attached Sai Baba Aarti booklets and check the home page for Aartis timings. Full Prayer Service in Boston, Greater Boston available. All Prayer Services inside the temple are no charge.